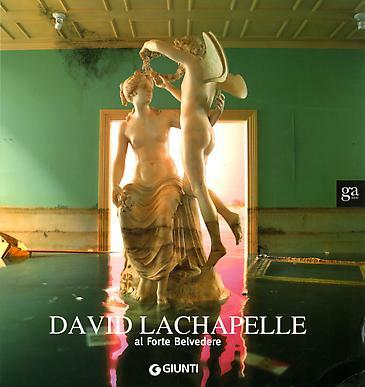 David LaChapelle is a narrative artist. He is interested in the obsessions of contemporary society. His photos shout. It is enough to scratch their surface, and wish to see what’s behind them. Beyond the truth of, if not everyday, certainly familiar situations, we find a human universe tinted with the colors and light of plastic, a universe that is morbidly attached to the search for pleasure and the superfluous. LaChapelle has until now preferred his photos to be seen in fashion magazines and in catalogs without texts. His aim has never been to be satisfied with mere illustration but to reach the widest possible public – which is his way of being a Pop artist – and to have his work appreciated by way of an emotion shock. LaChapelle’s photos are part of the world’s scenery, perfectly in line with today. However, despite their glamorous patina, they recount all that is good, bad, useful or useless. The subjects are men and women who are, for the most part, unusual, rich, and powerful. At times they are beautiful; at others grotesque. So beautiful and grotesque that at first sight we have the impression of being on a set of some unreality show where the characters at times change and alternate in order to construct their own story. Over-the-top and brazen men and women, occasionally coarse and vulgar. In this colorful and baroque atmosphere, where the protagonists look at and wink at us, promising us nirvana, we understand that the subjects risk losing themselves, are swallowed up by themselves, are the prisoners of things and seduced by goods to the point of becoming one of them, of becoming designer merchandise that tries to bewitch the consumer by camouflaging the truth in a psychedelic setting.